“The long days on the trail were filled with excitement for adventurous Carrie Talbot. And at the end of the trail waited more adventure–she was going to start a brand new life at the Indian mission established by her uncle. “Then a sudden encounter with an Indian raiding party left Carrie with more excitement than she wanted. As she rode off helplessly with her captors, frantic thoughts raced through Carrie’s mind. “Why was one of the Indians so interested in the family Bible she had managed to save? How could she escape? 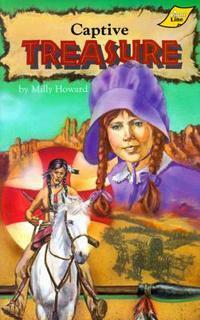 Even if she did, how could she ever find the wagon train again? I might read this book.